Please bring your newspapers to the shelter! There is an area to deposit them at the entrance to the parking lot, or you can bring them to the front office and then stop in and meet the pooches (and/or cats) yourself! Orphans of the Storm® has returned to its spot at Northbrook Court. Meet adoptable and adorable dogs and cats every Saturday and Sunday, 11am-5pm. The Orphans of the Storm® Annual Benefit Dinner is Monday, April 20–mark your calendar! Sandy the three-year-old Husky mix is a happy girl who eagerly greets everyone who walks by her kennel. When she saw me coming with the leash, she started jumping up and down as if she was on a pogo stick! Even though she was super excited, once she was on the leash she walked pretty well without much tugging. Sandy is naturally prepared for this type of cold weather, so she was ready to jump right into the snow. Sandy kind of kept to herself while we were in the off-leash run, since she was enjoying the chance to run around and explore (and politely sniff the dog on the other side of the fence), but when I hooked her back onto the leash and took her to a place where we could sit together, she attempted to climb into my lap and gave me a few happy doggy kisses. Who wouldn’t want a fluffy snuggle buddy? If you’re looking for a happy girl who can bring you years of happiness, come in soon to meet Sandy! Caesar the two-year-old Staffordshire Bull Terrier mix is a big, handsome boy whose unique looks caught my eye right away. Caesar has one blue eye and one brown eye (like Clarinet, Clint, Luciano, and Pancho!) and pretty chocolate-colored spots on his otherwise white fur. He has plenty of energy, so he would be happiest in a home that can give him the exercise and stimulation he needs, whether that be a big yard to romp in or long walks or plenty of playtime. 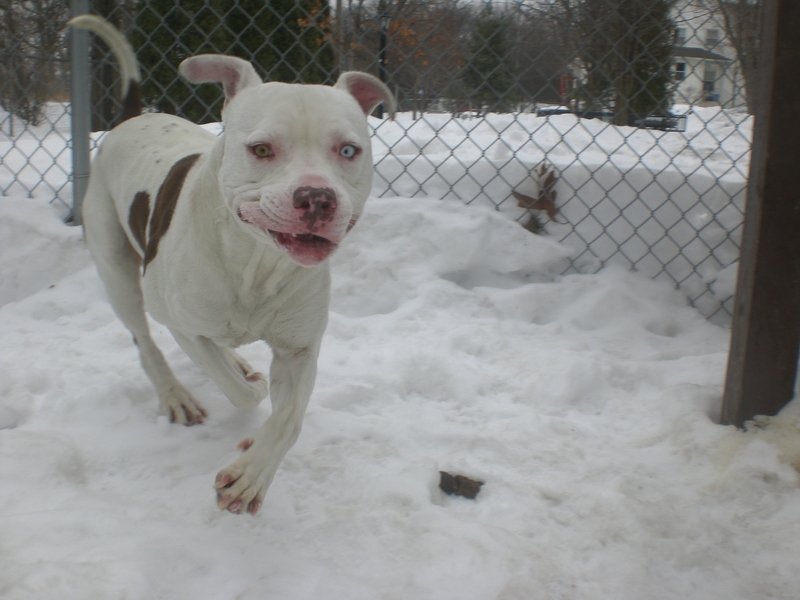 Caesar had a great time running around in the snow in the off-leash run. He happily chased after a ball I threw, though he doesn’t seem to have realized that if he picks it up and brings it back, that means I can throw it again. When we walked around for a bit with him on the leash, he mostly did pretty well, though sometimes he would pull if there was a particular direction he wanted to go in. 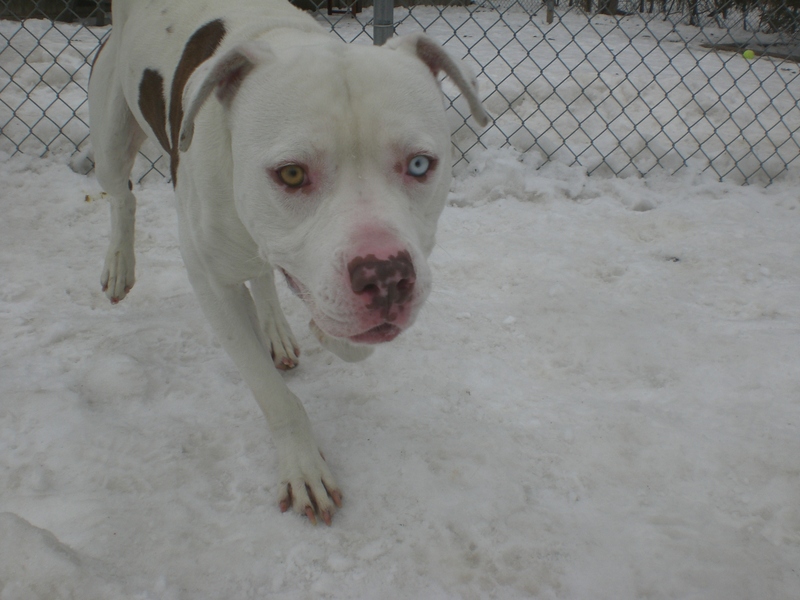 This big boy has an even bigger heart that he is ready to share with a new family. Stop by soon to say hello to Caesar! 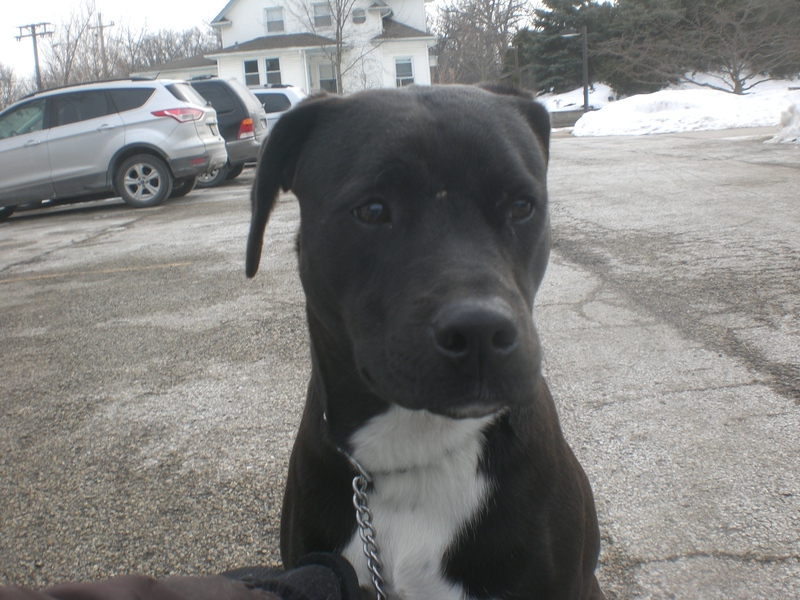 Belle the eight-month-old black Labrador Retriever mix is such a cutie. She’s a little nervous inside her kennel, since she’s new to the shelter, but when she’s out and about she seems much more comfortable. 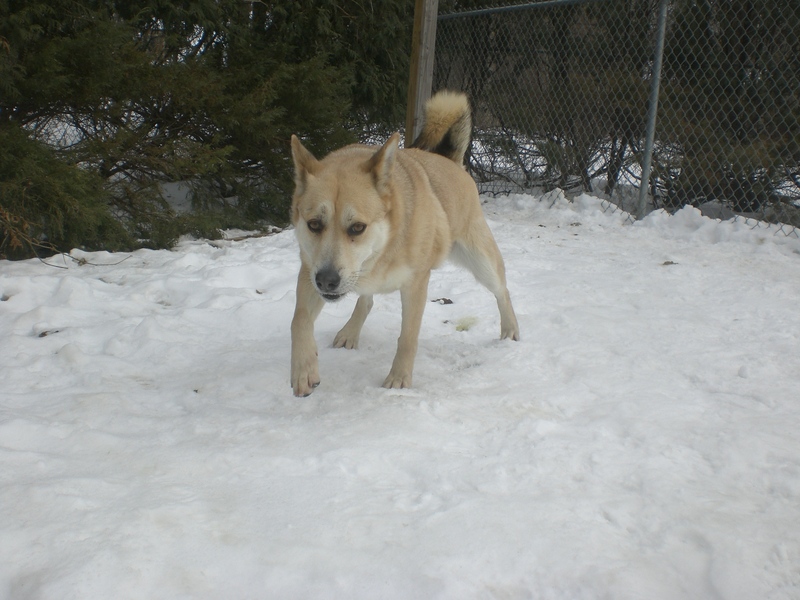 She’s currently sharing her kennel with Hachi (who is such an affectionate boy who gives great doggy hugs) and was eager to play with him when they were both outside, so she could go to a home with or without another dog. Belle is a real beauty! Belle walks pretty well on the leash and will stop and sit if you stop walking–which is quite impressive for a puppy! Whenever I knelt down next to her, she would put her front paw in my lap. She didn’t mind when I took her paw to practice the ‘shake’ command. Belle is a sweet girl who just needs someone to give her an extra boost of confidence. She also seems like a smart girl who is eager to please, so she should do well in obedience classes. If you’re considering adding a puppy to your home, come in soon to see if Belle is the pup for you! I also saw Bella, Blush, Chato, Cosmo, Gus, Jarvis, Rocky, Tom-Tom, and Winter. 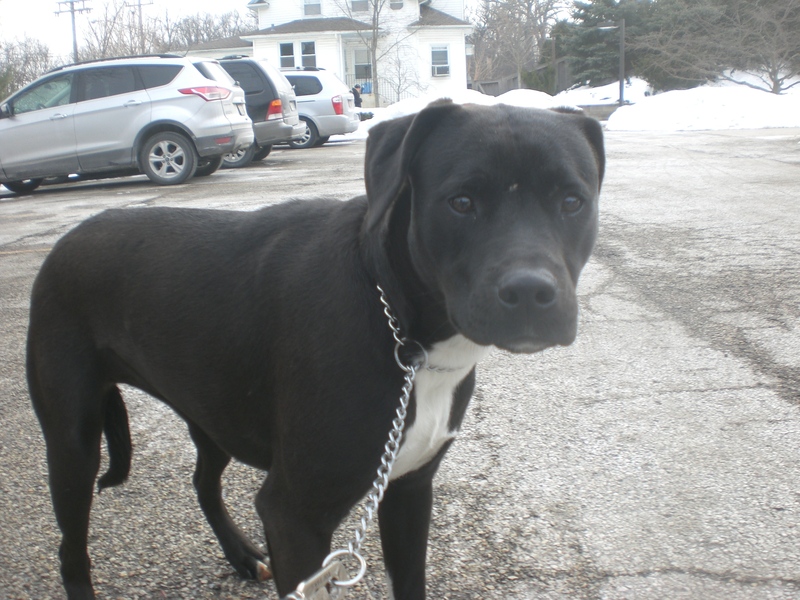 Posted by Meet the Pooches on February 26, 2015 in Dog Profiles and tagged adopt, animal shelter, animals, Chicago, dogs, Husky, Labrador Retriever, Northbrook Court, Orphans of the Storm, pets, Pit Bull Terrier.